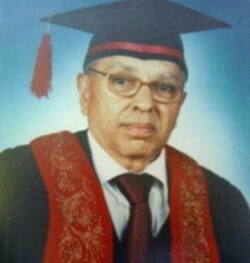 Professor Tilak Hettiarachchy who showed diverse facets of talent in the field of Arts and Linguistics is a wonderful product of that genre, as he had risen up to the highest possible point in that path, starting from the post of Assistant Lecturer right up to the highest administrative post in the University. Born in 1943 in the village of Halgampitiya Watta, Veyangoda which is situated in the Siyane Korale, he received his post primary and secondary education at St. Mary’s College in Veyangoda and entered the University of Ceylon at Peradeniya in 1961. He was awarded the degree of Bachelor of Arts with 1st Class Honours in History in 1965 , and was appointed Assistant Lecturer, University of Peradeniya in the same year. Professor Hettiarachchy proceeded to the School of Oriental and African Studies of University of London in 1967 and resumed work in 1970 having obtained a Doctor of Philosophy in History. He also obtained a Masters degree in Sociology from McMaster University, Canada, in 1976. By this time, Professor Tilak Hettiarachchy was promoted to the post of Senior Lecturer from the post of Lecturer at the University of Ceylon, Peradeniya. In 1984, he obtained further field training in social studies in the University of Leiden, Netherlands. Professor Tilak Hettirarachchy then joined the University of Colombo as Senior Lecturer in Sociology. This marked the beginning of a long and responsible journey. Then, he was appointed an Associate Professor in the Department of Sociology of the University of Colombo and subsequently, to the post of Head of the Department of Sociology. He was promoted to Professor in Sociology in 2004. Considering his great services, he was appointed Dean of the Faculty of Graduate Studies. Thereafter he assumed duties as the Rector of the Sri Palee Campus at Horana. Professor Tilak Hettirarachchy was appointed as the Vice Chancellor of the University of Colombo on 19/8/2002 and held this office with distinction up to end of 2007. He retired from the University service in 2008. During his tenure of service, he presented a number of research papers, thereby rendering a great service to the discipline of History. The books written by him in English such as “History of Kingship of Ceylon” and “Sinhala Peasant” are important masterpieces in the field of History. The article written for the Human Rights Commission of Bangkok “Working in the Zone” received much praise. He had also published a book on the subject of Sociology named “Media Boards” for the perusal of students of Sociology. Apart from his university service, he served in the capacity of Consultant at different institutions, providing diverse types of consultancy services. Professor Hettiarachchy’s guiding principle during his tenure as Vice Chancellor was to do the best he could for the development and wellbeing of the University of Colombo. His achievements in this respect speak for themselves. We wish him good health and the strength to continue his quest in the academic world, to enrich and educate future generations through his writings.